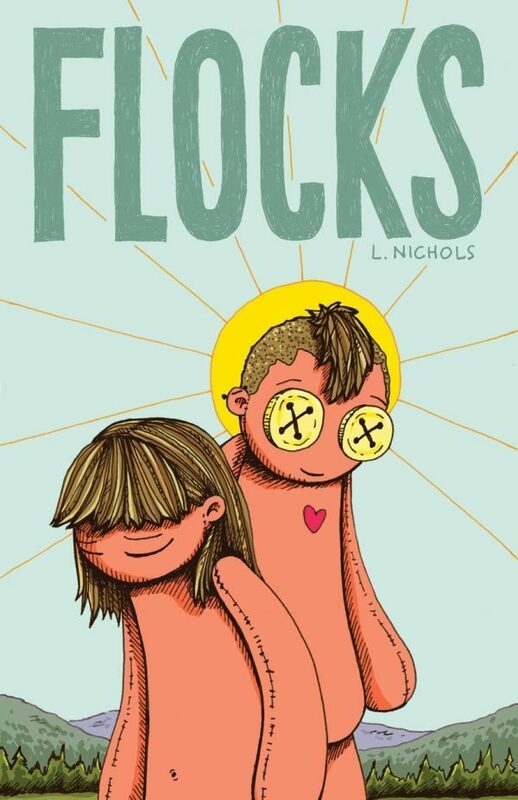 Flocks is a memoir, but where did the idea of making it start? 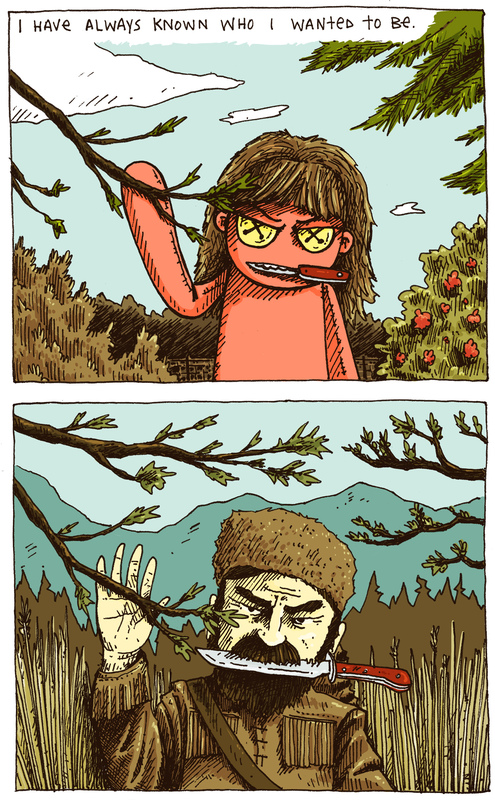 Back when Retrofit Comics was getting started, Box asked me to do a comic for it. I was trying to figure out what I wanted to write about and a friend suggested it. I don’t know. It was the right time. I had a reason to do it. When I started I had never done anything this long and so I decided to write it so that every chapter is self contained but they reference each other and there’s a progression. That was my way of getting around not knowing how to tackle something longer. 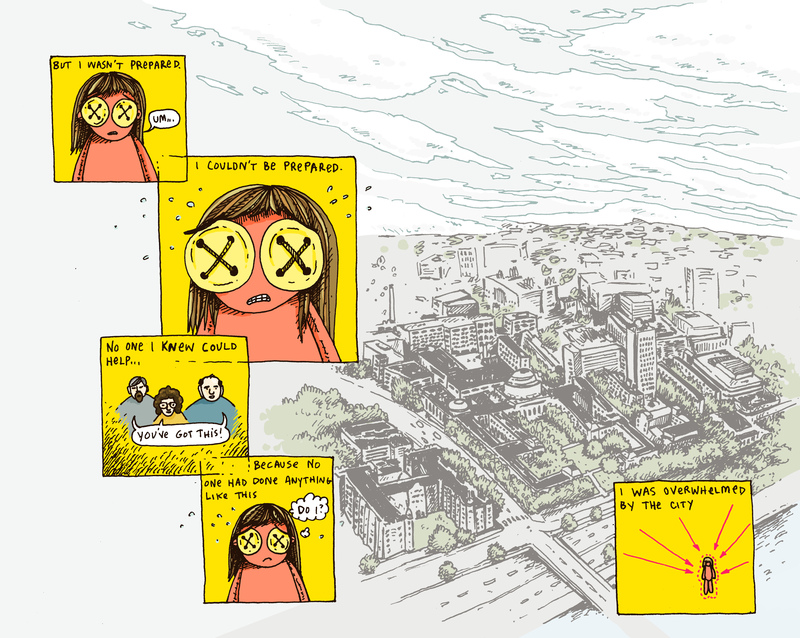 Also I knew the first issue would be a Retrofit comic and I needed to keep the page limit to a certain amount. How did you decide to portray yourself? I don’t know if you saw any of my short comics like Jumbly Junkery, but I’ve been drawing myself like that for quite a while. It started when I was living in England for a year back in 2003-4. I would draw these doll figures doing whatever we were doing. They weren’t comics they were just drawings, but at some point I realized that I was giving them my hairdo and my piercings and I went, oh. I was drawing myself. At that point I thought, I can use this as a way to sort through feelings in a more distanced way where it’s easier for me to figure out what’s going on. I think with the gender thing – this was before I transitioned – there’s a certain amount of that in there unconsciously. I didn’t really identify portraying myself in a physical body, so this was a way for me to do it. I don’t know. It’s cute. I like drawing the little button eyes. You mentioned how you designed each comic to stand alone, and so I expected the book to feel somewhat episodic, but it came together very smoothly. Oh, good. That was my hope for it. I tried to pack a chunk of writing into each chapter, focus on these topics, and try to move forward that way. The book has an arc that’s very effective. And I will say that by chapter 5 when you have friends who say, we know you’re queer and it’s okay, I did not realize how much I’d been holding in my breath. [laughs] It was not the easiest time of my life. 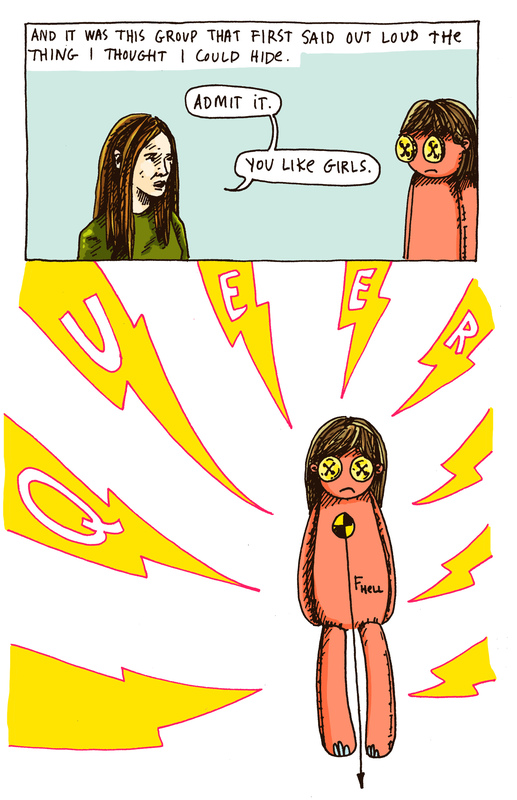 One image from Flocks that has stayed with me for years is a panel of you and the word QUEER taking up the space of the panel and weighing you down. Yeah, the word has been reclaimed somewhat but where I came from that was the worst thing ever. The town I grew up in didn’t have any LGBTQ people of any variety at all. It just wasn’t a thing that I thought would ever be okay. That’s why it took such a long time to figure out how to be okay with myself and that part of myself. I was really trying to capture that feeling of being suffocated by this thing that everyone else around me was saying is a horrible thing and you’re going to hell. Despite your upbringing, you try to be very kind and open towards people. That’s something I’ve thought about a lot. As much as I’d have liked my past to have been less difficult, I wouldn’t be the person I am had I not gone through it. At some point I had to reconcile myself with it. This is my past. Not beat myself up for it and not regret it, because I can’t change it. I feel like as I’ve gotten older, it’s a lot tougher to be open. It’s hard. It’s much easier to close yourself away and push people away. I try very hard to accept people as people and realize that we’re all flawed. We all have these expectations of whatever upbringing we had. There’s expectations about who we are, who we become, how we should behave, what’s okay, what’s not okay. It’s something I actively try to do. That being said, I feel like some people there’s no good faith interacting with them that will really change them. If all someone wants to do it tear you down, then don’t. In my interactions with people, though, they surprise you. People are a lot more willing to change than maybe you think. Sometimes they’re okay with one person or two people but still not okay with the concept, but every little bit helps. I still go to church. I go to a church that’s very open and very supportive and actively trying to engage with LGBT issues and equality issues of various sorts. I feel like churches can be a good example of human community – but they’re not always that. [laughs] It’s nice to be reminded that they can do that and should do that. At the end of the book you have a clergy member talking about radical love and radical acceptance. I keep thinking that’s how you see religion. It’s connected to this sense of compassion and openness and if people who describe themselves as christian refuse to meet you in that same way, that’s their own shortcoming. Exactly. That’s exactly how I see it. For me it was realizing that I needed to be okay with who I was going to be, because at some point my life is my life. The way I raise my children I try very hard to say, I don’t care what you do, I don’t care who you are, I want you to be kind and good people and to do something you care about. I feel like there’s a lot of pressure put on me in various ways growing up about how I should be. Parenting is the hardest and strangest thing I’ve ever done. You attended MIT and studied engineering. How much of engineering and math and learning to think in those terms has that affected the ways you think about comics and design and space? It’s affected the way I think about comics for sure. A lot of what I learned about comics actually came while I was studying at school. I took a class on comics with Henry Jenkins. I’d never really read more than a couple of newspaper comics and I had the notion of what superheroes were, but for a very long time I thought, I can’t make comics because I’m not funny and I don’t want to draw superheroes. [laughs] It was around the time that American Splendor came out and I saw that and took this class on comics. I’d been drawing my whole life and a lot of my drawings were narratively driven in some way. I always liked to draw maps because whenever I read a fantasy novels I wanted to draw maps of the places. Or the little ragdoll drawings I did back in the day. I took this class and went, I can draw comics, this is great. I came to drawing comics from a very analytical perspective. I was taking a class on writing about comics and I tried to do these experiments of my own. That wasn’t an engineering class, but it was still taught in this very analytical way. As far as engineering goes, there was a moment when I realized that engineering is a fantastic field because you learn that there isn’t just one right answer. You can be given a design brief and you have your client and they need this thing. Every single engineer in the room will have a different idea about how to approach it. And really the test is, does it work or doesn’t it work? Does it meet the goal or not meet the goal? I feel like that’s a far better mindset than the one you learn in school where something is either right or wrong. The engineering mindset is more what is my goal, how do I get to my goal, what are the milestones to get to my goal. It’s a very iterative process so you try something and if it doesn’t work, you change something and try again. It’s really hard for me to separate that mindset from everything I do. I think that’s really just how I approach my life, which is, what is my goal and how can this work? It’s freeing in some way when you realize that you don’t to find this exact solution, you just need to find a solution that works for you in the given circumstances. So engineering has formatively changed the way I think. Everything can be changed and modified and made better. If it’s not right, you can work on it to be better. I put equations into my comics and arrows and stuff like that. Part of that is the desire to compress information into a smaller space and to have something that can be read on different levels. Comics are words and pictures and symbols are just pictures, and math is a certain type of symbol. It’s not like you’re missing that much if you don’t get it, but it’s a nod to my past and also the way that I fundamentally think about the world in these very engineering-y, fixing it type ways. I wanted to talk about Ley Lines, the quarterly comics series you co-publish and you’re making the new issue which is about Beethoven. For people who don’t know, what is Ley Lines? Let me read the blurb from the back of the book. [laughs] It’s a quarterly publication dedicated to exploring the intersection of comics and the various fields of art and culture that inspire us. I basically started because like I was telling you, I didn’t really read comics growing up and most of my inspirations for doing what I do don’t come from comics. I love modern art and I love music and dance and theater. Henry Jenkins in that class I took was interested in fan culture and particularly how fan culture is very appropriative. How fans feel free to take the imagery and remix it and rewrite it and make fanfiction and fanart. He said, where is this for fine art? I spent many years pondering, what would fan comics of fine art look like. That was my inspiration. I said, I want to do this and Annie Mok said, I want to do one about Egon Schiele. I said, let’s do this now. [laughs] It’s been a wide range of topics over the past few years. I picked Beethoven because I’ve been trying to learn this one sonata for like two years now. I still can’t play it. [laughs] It is orders of magnitude more difficult than anything I’ve attempted to play in the past. And this is after not playing for fifteen years or so. We don’t tell the artist what to make. We ask them what do you want to write about because what we’re interested in is what their inspirations and interests are and their personal connection to whatever it is. So they’re all very different, but I feel like they work together. It’s actually turned out way better than I even imagined. Everyone has done such amazing job. I am incredibly grateful to everyone who has been willing to do an issue and to Annie Koyama who helped us financially. It’s amazing. Do you have a list of people who you’d like to contribute and ask, are you interested? Or how does it work? The first year that was what we did. Annie Mok was super excited and I said, sounds great. Warren Craghead I basically just told him, you’re going to do one. [laughs] So the first year was us approaching people but since then it’s like half and half. We have people approach us with ideas. Like Shreyas Krishnan who did Maqsood-I-Kainaat. Shreyas came up to me at SPX a few years back and said, I love Ley Lines, I’d like to do one. I said, okay give me your card and I checked out her work and really liked it and so Kevin and I asked her to contribute. So we have a list of people we would like to do one and we have a list of people who approach us with ideas at this point. It’s very heartening to me to see that people respond to it in the way that they do. I always intended the series to be very heartfelt and very about a personal relationship with the work and people have really responded to that. When you ask people, is there a guideline you give them? We tell them the size and the page count. I mean we don’t want to repeat topics. Usually they have an idea and we tell them to go for it and that’s it. We don’t tend to do much editing work. We have a brief we give them. It’s a paragraph. [laughs] If artists want us to look at it and give them feedback, we will do that, but it’s up to them. We don’t want to step on anyone’s toes. In part because the whole motivation behind it is the relationship of the comic artist with whatever topic they’ve chosen to write about. I’m guessing that you and Kevin have a year or two planned in advance. At this point, yes. We only publish four a year. I feel like if we did more it would be too much. This way every one gets its own time. There’s enough artists that want to do one that hopefully it’s not too much of a hassle. I think it’s a good schedule. It’s a manageable schedule. You know how they always say if you want something, you should make it? These are my ideal comics to read. [laughs] It’s nice to help bring them into the world. Going forward with the series is there something you want to do more of or hope people approach you with? I would like to see more topics. This past year was really exciting because it was a lot of stuff I didn’t know about. I find it inspiring. I guess in the future I’d love to see more surprises. When I first thought of doing Beethoven I thought, maybe that’s obvious? But I genuinely love classical music. I’ve played the piano since I was a very small child. I love it so much and I wish more people loved it. It’s definitely a different way of listening to music because it’s on a much longer timescale. I guess what I want in the future is more. [laughs] More inspirations. More people I didn’t know about. More artists who contact us with an idea. It’s always great learning about new comics artists as well as other artists and musicians and writers or whatever. Maybe at some point we’ll make a book, but I don’t know. We haven’t quite figured that out. People have covered Beethoven and Kylie Minogue, boredom and gothic architecture and Cy Twombly. It’s a pretty wide range of topics in Ley Lines. Certainly everything is not for everyone, but hopefully there’s a bunch of different things for people. 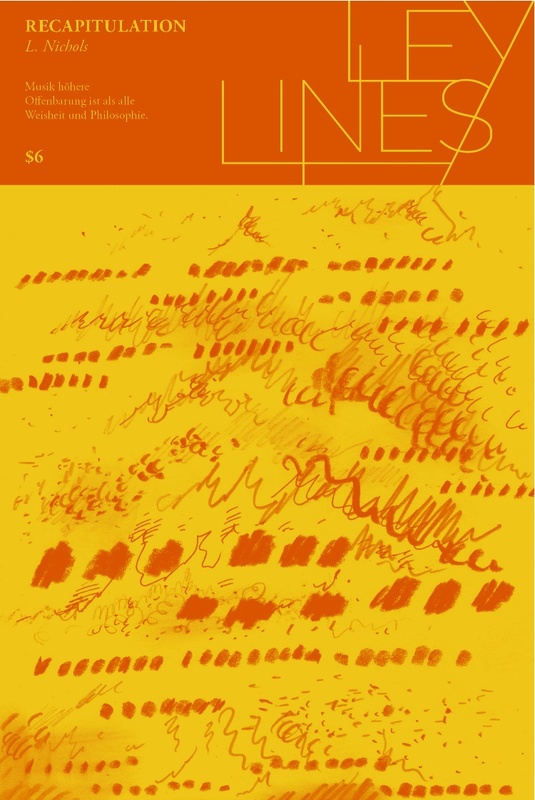 Flocks is finally out and you finished an issue of Ley Lines. Have you started thinking about another big project? Has finishing Flocks made you want to make another big project? I actually like working on bigger things because I like working on things at different scales. I definitely have not counted out doing something big in the future. I have some projects I want to work on. I’m trying to hike all of the high peaks in the Catskills. They’re all about 3500 feet, so not huge mountains but there are a lot. I’ve been doing charcoal drawings on my hikes. 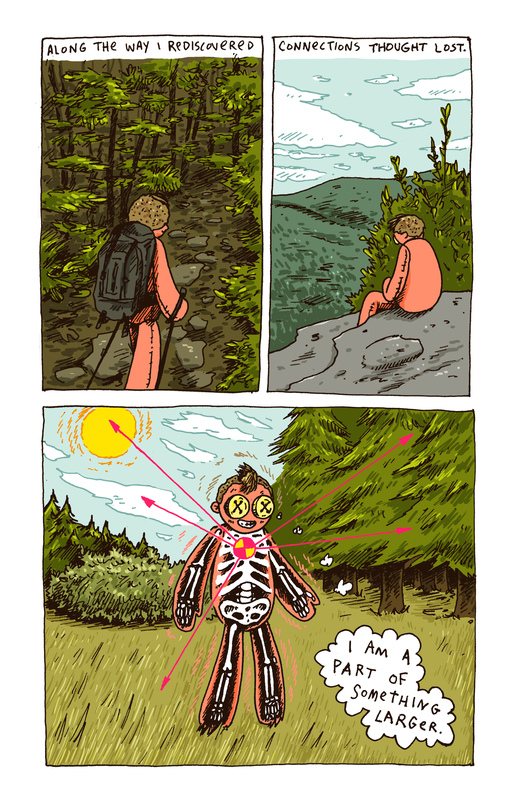 Kind of a comic, kind of a series of illustrations, about thoughts that I’ve had. In the future I’d like to do something about parenting. Especially as a trans parent. What it’s like having kids you have to explain yourself to. I’m not biologically related to them, so what were my worries going into being a parent and how has that changed now that I have kids. Otherwise, smaller projects. 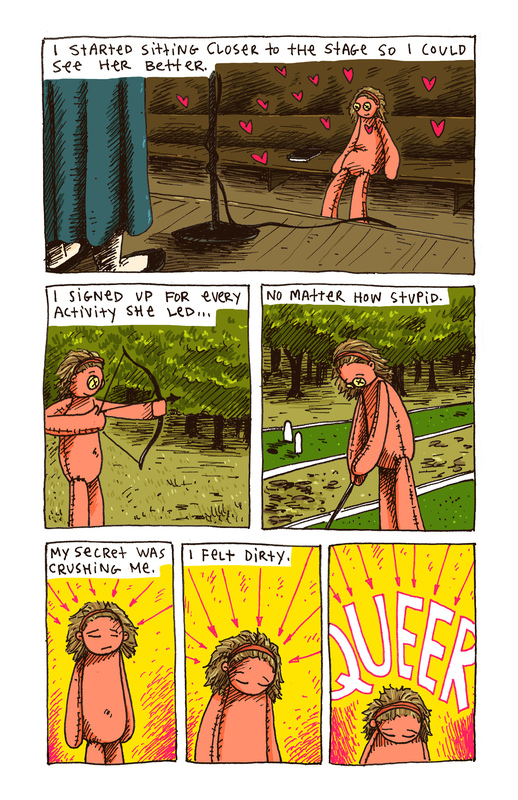 I finished up this poetry collaboration I did with a friend where we wrote a poem together and I did a comic for it. I haven’t had a chance to print that yet. I’ll probably print that by the end of the year – or when I have some money. [laughs] I also paint so I’ve been trying to set up my studio to actually paint. It’s weird because after finishing a book there’s so much time between turning in your manuscript and when it comes out. It’s like, what am I doing with my life? I don’t know. Hopefully people like the book. I put a lot of effort into it.